Before you start, you might want to consider actually quantifying your office carbon footprint to identify the more effective strategy for lowering emissions and enhancing sustainability in your work (https://carbonfund.org/business-calculator). - Replace your standard lightbulbs with compact fluorescent lightbulbs (CFLs), which use 66 percent less energy and last about 10 times longer than conventional bulbs. For more info, check out: http://www.energystar.gov/ and http://www.treehugger.com/htgg/how-to-go-green-lighting.html. - Eliminate screen savers and power down your computer (or set to it to sleep mode) when you leave your office. This can prevent about 300 pounds of carbon dioxide emissions each year. Cant remember to do this? No problem, there is a program that will do it for you (http://www.aptean.com/solutions/application/power-management)! - Recycle batteries, and toner cartridges (e.g. http://www.nationaltoner.com/). If your office or building does not participate in a recycling program, find one yourself at http://www.earth911.com/. - When purchasing new office equipment, keep sustainability in mind. Use a calculator to figure out the more efficient supplies (http://www.hp.com/large/cfc/index.html). - Cold in the office? Forget a space heater! Wear a sweater! - Your wallet is one of the most important things you have to make a statement about sustainable strategies. 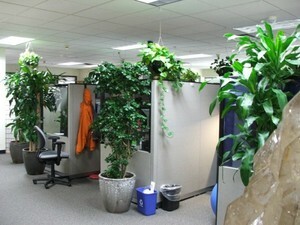 Currently, almost every office product can be made ‘green’. From pens and markers to paper products for printing purposes and even remanufactured ink and laser toner for printers and fax machines. Purchasing recycled materials is not only more sustainable (for example, recycled paper required 55% less water and 65% less energy to produce than conventional paper), but is often much cheaper than conventional. Not sure about how eco conscious a product really is? Look for credible third-party certifications on packaging. On paper products, for example, look for a Forest Stewardship Council certification: https://us.fsc.org/. - There are even programs that can help you identify areas of waste in printing (e.g. http://www.ecoprint2.jp/). Even if you have to contract out for printing services (who has a poster printer in their office?! ), you can do so conscientiously. Check out places like Ink Works (http://inkworkspress.com/), recycled paper printing, Inc (http://www.recycledpaper.com/), and Red Sun Press (http://www.redsunpress.com/) for sustainable printing options. - Turn your thermostat down to 68°F in the winter and 78°F in the summer. - Keeping a plant in your office not only reminds you of a world beyond your desk, but can actually cool the air through transpiration. - In addition to getting your office mates/building mates/ neighbors/ pets/ family pumped about greening your office, you might need a bit more help. Bring attention to the value of sustainability with celebrations like earth day, America recycles day and energy awareness month. Remember: sustainability should be maintained inside and outside of your lab. Do your part!